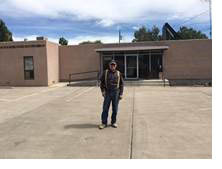 In 1985, Dr. Richard Santi approached Leonard Velasquez of SLV Quality Concrete, an American Society of Concrete Contractors member, about replacing his asphalt parking lot with concrete pavement. Dr. Santi wanted to stop spending money on maintaining the old asphalt lot at his office. After discovering that the subgrade beneath the asphalt was very poor, Mr. Velasquez (shown here at Dr. Santi's office) suggested a new approach – overlay the asphalt with 5" of concrete, reports NRMCA Vice President, Local Paving, Don Clem. With Dr. Santi’s approval, SLV placed the first known concrete overlay over asphalt in Colorado. Neither man dreamed that the parking lot would still be in service, welcoming patients more than 30 years later - and with the added benefit that very little was spent on maintaining the parking lot during that time. Milis Flatwork in Kaukauna, WI, is a relatively young concrete construction company run by an engineer/contractor named Dylan Milis who started it by focusing mainly on agricultural construction until an equipment salesman from an NRMCA member company told him about NRMCA’s popular Parking Lot Boot Camp. After convincing NRMCA's Jon Hansen and Phil Kresge that his company, which consisted of three people at the time, was worth investing their time to conduct a Parking Lot Boot Camp, the rest is a success story you will want to know more about. Next Tuesday, October 3 from 11 a.m. to noon, plan to attend the NRMCA and ASCC Contractor Partnering - A Success Model for Moving Your Paving Market during the PaveAhead session at ConcreteWorks. Hear from Dylan the equipment salesman and NRMCA staff on how to put together winning partnership to capture concrete parking lots, both new and overlays, in your market. This is one session you won’t want to miss. For more information, contact Jon Hansen at jhansen@nrmca.org or Phil Kresge at pkresge@nrmca.org. Leigh Brumley Smith, the wife of former NRMCA Board of Directors' member D. Van Smith, has passed away at the age of 51. A resident of Charleston, SC, Mrs. Smith died on September 25. Her funeral and interment will be a private family service at the Brumley Family Cemetery on Wadmalaw Island, SC. Leigh was born on August 28, 1966, in St. Mary's, GA, the daughter of Frank Warner and Blanche Crawford Cauthen Brumley. She attended Trident Academy in Mt. Pleasant and Brenau College in Gainesville, GA and was a member of First (Scots) Presbyterian Church. In addition to her husband, she is survived by her daughter Crawford, sons Van Noy and Brumley, father and mother Frank Warner and Blanche Crawford Cauthen Brumley all of Charleston, SC, and many other relatives. In lieu of flowers, donations can be made to Lowcountry Lab Rescue, P.O. Box 80418, Charleston, SC 29416 or The Ronald McDonald House, 81 Gadsden St. Charleston, SC 29401. Click here for more information. The green building movement continues to gain momentum as developers, government agencies and designers build structures to minimize environmental impact. NRMCA will host training sessions to build industry awareness and enable ready mixed concrete producers to developed their responses to green building market trends. This is the last call to register for NRMCA’s Fall 2017 Safety Course in Denver from October 17 - 19; only three seats remain. This 2.5-day course teaches participants about OSHA safety compliance beginning with why safety is so important and details the reasons why an effective safety program actually saves money through loss prevention and control. Participants learn about electrical safety, machine guarding, fall protection, hazard communication, confined spaces, personal protective equipment, firefighting and evacuation, maintenance shop safety, chute handling, fleet safety, pre-trip inspection and more. Earlier this week, NRMCA submitted comments to the Environmental Protection Agency (EPA) and the U.S. Army Corps. of Engineers (Corps.) opposing the EPA/Corps. Waters of the U.S. rule, or WOTUS for short. Specifically, the WOTUS rule aims to determine what can be considered a "water of the U.S." under the Clean Water Act and thus under the jurisdiction of the federal government; NRMCA believes this amounts to a very large jurisdictional expansion. Currently, the WOTUS rule has been stayed nationwide by federal courts since last November while multiple legal challenges to the rule work their way through the court system. NRMCA members may click here to access the link to download the full report. For more information, contact Eileen Dickson at edickson@nrmca.org. NRMCA, the Aggregate and Ready Mix Association of Minnesota and the Minnesota Concrete Council are presenting the one-day course Improving Concrete Quality, intended for concrete producers, ingredient material suppliers, engineers, testing labs and contractors, on Wednesday, January 17 in Eagan, MN. Improving Concrete Quality, a book authored by one of the instructors, and other NRMCA resources provide the basic content for the course. This compilation of ASTM standards is available from NRMCA at a significant discount off the ASTM list price for NRMCA members only. The compilation, CONCRETE17, includes 43 current standards referenced in ASTM C94, Specification for Ready Mixed Concrete, and additional standards relevant to those involved in specifying, purchasing, manufacturing, testing and supplying ingredient materials for ready mixed concrete. The standards in this compilation are also referenced in ACI 318 (Building Code) and ACI 301 (Specifications) as they are applicable to concrete materials and testing. Non-members of NRMCA can obtain this compilation from ASTM International at www.astm.org. For information on publication CONCRETE17, contact Jacques Jenkins at jjenkins@nrmca.org. NRMCA is offering its information packed, one-day course, Handling Concrete Specifications, Low Strength Problems and Mixture Submittals, intended for concrete producers, contractors, engineers and testing labs on Thursday, November 2, in Salt Lake City in association with the ACI Intermountain Chapter. With lots of time to plan and budget your staff’s career development, please note that the following classes will be offered under the auspices of the OES Committee.